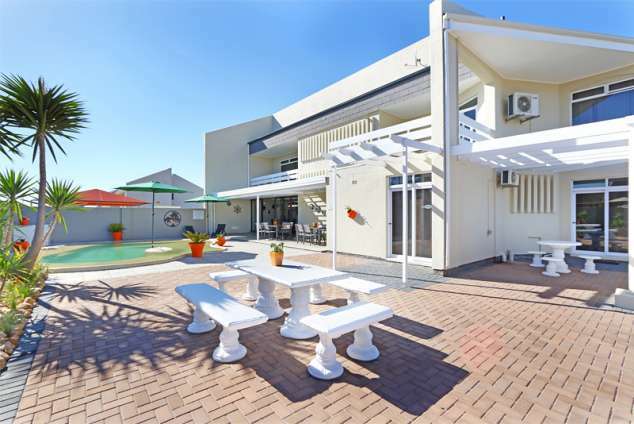 Orange Inn Melkbosstrand - Melkbosstrand Accommodation. At the Orange Inn Melkbosstrand, you can expect a warm welcome, a good breakfast and luxury accommodation including our comfortable king-size beds. The Orange Inn guest house is situated just a short drive from central Cape Town in Melkbosstrand, named after the Milkwood (Melkbos in Afrikaans) trees that grow to the north of the town and the gateway to the beautiful West Coast. Relax in the comfort of one of the spacious, luxury bedroom suites. Visit the relaxed Melkbosstrand beach, unwind in the downstairs lounge or in the privacy of your own patio (not all rooms). Cool off in the sparkling beach-type swimming pool or relax at our entertainment area with braai facility. After a peaceful night's sleep, enjoy a mouth-watering English- or Continental breakfast in the sunny poolside enclosure. 1x Family room for 2 adults and 2 children over 12 years. 1x Disabled-friendly room with roll-in shower with fold-out seat and toilet grab rails. All rooms have king-size beds. For a nominal fee we offer airport transfers (airport is 30kms away). Transfers by prior arrangement. Free WiFi in all rooms. Quality beds, linen and furniture. Breakfast included for all our guests. Air conditioning in all our rooms. "Hotel package" DSTV TV channels in all our rooms. 1348 page views since 04 Jul, 2017. Last updated on 16 Jan, 2019. Subscribe and be notified the moment this property posts a special! Be the first to know and never miss out! A confirmation message will be sent to you before this subscription is activated. Waiting for a Special Deal? the minute they post a Special Deal!